Polygon Bilge Wash is a unique product. It is a blend of soaps and builders with a biocide added. Polygon Bilge Wash is a powder contained in a polymer sachet. This sachet is water soluble and can be added straight to the bilge or pre-dissolved in water and this solution then poured into the bilge. The rocking motion of the vessel helps the product to disperse oil, suspend solids and disinfect the bilge. After a few days, the contents of the bilge can be pumped into a suitable container for safe disposal, leaving the bilge clean and disinfected. 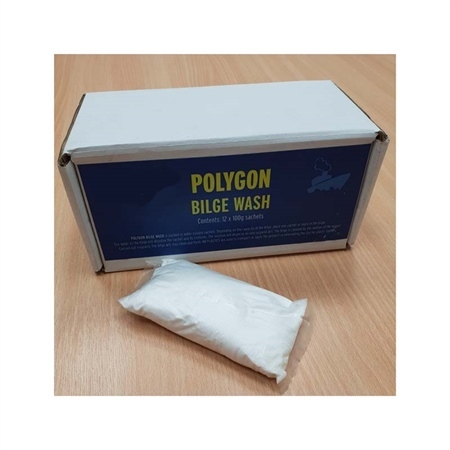 Polygon Bilge Wash, when dissolved in water, is a powerful cleaning agent which is safe to use. It uses no plastics for packaging and regular use of this instead of a liquid product will greatly reduce the use of plastic containers to distribute liquid bilge wash. Therefore, by using polygon bilge wash you are using a fully biodegradable product packed in soluble sachets which are transportable and recyclable cardboard cartons. Polygon Bilge Wash is supplied in 100-gram soluble sachets. Simply add one sachet per 5-litre water, hot or cold and add to the bilge. This solution can also be used to clean decks, superstructure and hulls.